UPSC Civil Services Exams 2019 Notification | IAS, IPS, IFS Recruitment Apply Online at upsconline.nic.in : UPSC Civil Services Exams 2019 Notification | IAS, IPS, IFS Recruitment Notification Apply Online at upsconline.nic.in. 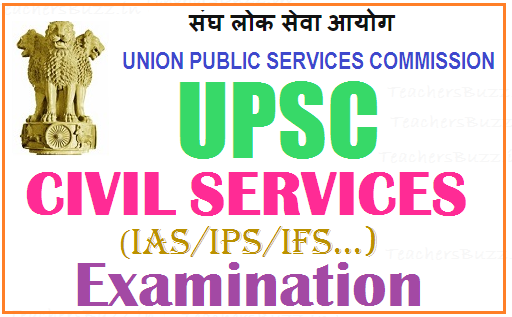 UPSC Civil Services Examination 2019 Notification, Union Public Service Commission (UPSC) has released an official notification of Civil Services examination 2019 on its official website. Preliminary Examination of the Civil Services Examination for recruitment to the Services and Posts mentioned below will be held by the Union Public Service Commission on 18th June, 2019 in accordance with the Rules published by the Department of Personnel & Training in the Gazette of India Extraordinary and the Main Examination is likely to be held in October, 2019. Applications are now invited for the Civil Services (Preliminary) Examination only. Candidates who are declared by the Commission to have qualified for admission to the Civil Services (Main) Examination will have to apply online again, in the Detailed Application Form which would be made available to them. UPSC Civil Services recruitment notification details like eligibility conditions, how to apply, exam fee structure, syllabus of exam for various subjects, last date to apply, how to apply, online application, hall tickets,results and more details are given here. (iv) Indian P & T Accounts & Finance Service, Group ‘A’. (v) Indian Audit and Accounts Service, Group ‘A’. (vi) Indian Revenue Service (Customs and Central Excise), Group ‘A’. (vii) Indian Defence Accounts Service, Group ‘A’. (ix) Indian Ordnance Factories Service, Group ‘A’ (Assistant Works Manager, Administration). (x) Indian Postal Service, Group ‘A’. (xi) Indian Civil Accounts Service, Group ‘A’. (xii) Indian Railway Traffic Service, Group ‘A’. (xiii) Indian Railway Accounts Service, Group 'A'. (xv) Post of Assistant Security Commissioner in Railway Protection Force, Group ‘A’ (xvi) Indian Defence Estates Service, Group ‘A’. (xvii) Indian Information Service (Junior Grade), Group ‘A’. (xviii) Indian Trade Service, Group 'A' (Gr. III). (xxiii) Pondicherry Civil Service, Group 'B'. (xxiv) Pondicherry Police Service, Group ‘B’. Total number of vacancies to be filled : approximately 980. The candidate must hold a undergraduate degree of any recognized Universities incorporated by an Act of the Central or State Legislature in India. 1. For general category candidates, it is six attempts till 32 years of age. 2. The number of attempts for OBC candidates is 9 till 35 years of age. 3. The number of attempts for SC/ST exam candidates, it is unlimited attempts till 37 years of age. Applications are now invited for the Civil Services (Preliminary) Examination only. Candidates who are declared by the Commission to have qualified for admission to the Civil Services (Main) Examination will have to apply online again, in the Detailed Application Form which would be made available to them. The Main Examination is likely to be held in October, 2019. 1. Candidates are required to apply online using the website http://www.upsconline.nic.in Detailed instructions for filling up online applications are available on the above mentioned website. 3. (Registration ID) shall be entertained by the Commission and fee paid against one RID shall not be adjusted against any other RID. 4. All candidates, whether already in Government Service, Government owned industrial undertakings or other similar organisations or in private employment should submit their applications direct to the Commission. 5. Persons already in Government Service, whether in a permanent or temporary capacity or as work charged employees other than casual or daily rated employees or those serving under the Public Enterprises are however, required to submit an undertaking that they have informed in writing to their Head of Office/Department that they have applied for the Examination. Candidates should note that in case a communication is received from their employer by the Commission withholding permission to the candidates applying for/appearing at the examination, their application will be liable to be rejected/candidature will be liable to be cancelled. Last Date for submission of online Applications: 17/03/2019till 6:00 PM. In case of any guidance/information/clarification over Telephone No. 011-23385271/011-23381125/011-23098543 on working days between 10.00 hrs and 17.00 hrs. Note: Visit UPSC’s official website regularly for latest updates about the exam. The Candidates applying for the examination should ensure that they fulfill all eligibility conditions for admission to examination. Their admission to all the stages of the examination will be purely provisional subject to satisfying the prescribed eligibility conditions. Mere issue of admission certificate to the candidate will not imply that his/her candidature has been finally cleared by the Commission. The Commission takes up verification of eligibility conditions with reference to original documents only after the candidate has qualified for Interview/Personality Test. Tags: Civils, UPSC civils exams, UPSC Civil Services Exams 2019 Notification, IAS, IPS, IFS Recruitment 2019, Civil services prelims exam eligibility, scheme of examination, syllabus,how to apply, online applications, hall tickets/admit cards,results,qualified candidates list for UPSC Civil services mains examination details are available at http://www.upsc.gov.in/ or https://upsconline.nic.in/ .